Wearing red lipstick can boost our confident level. However, not all women are brave enough slayin' such gorgeous lip colour. 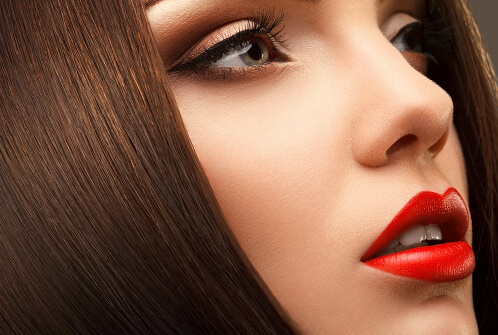 Some afraid red lipstick might be too much for everyday look, and some say red lipstick attracted too much of attention. You are not alone on this. I also felt the same way sometimes. But after reading some tips of wearing red lipstick, I can say that I can rock the colour whenever I want (well, of course you have to wear it on the right occassion). So here I am, sharing a few useful information that I have learned from a few articles that I found. The do's and don'ts in wearing red lipstick. 1) Prep your lips. Make sure your lips is hydrated. You can either use a lip scrub, or you can apply some lip balm (petroleum jelly also works just the same) a few minutes before wearing the red lipstick. It will give you a smooth lips for flawless application. 2) Simple eye makeup. When wearing a red lipstick, it is already enough to attract people's attention because of the fabulous colour. So keep your eye makeup simple. An eyeliner, a smooth clean wing, and mascara should be enough. However, if you think you can still rock the eye makeup with that red lips, as long as it looks good on you, then why not? 3) Remove excess lipstick. When you planning to wear red lipstick, don't forget to remove the excess product. I saw a few girls in my college, and they were all look so gorgeous with the red lips. But when they smile, I saw a red lipstick on their teeth. And trust me, it does not look good especially in front of the boys *laughing. Here are some tips on how to avoid getting lipstick on your teeth. 2) Overdo it. Avoid smudges and stains. Red lipstick is very easy to bleed and leave stains here and there especially when you're enjoying your meal. Don't go crazy with the gloss. Stay matte if you could. But if you want a bit of glossy on your lips, add just a touch of lipgloss should be enough, and blend it with a lip brush. 3) Wear with bright colour. Again, because red lipstick is already attract too much attention, try to avoid pair it with green, pink, or yellow clothes. And you might also want to look at the colour of your accessories or jewelries. Still want to wear the red lipstick? Or have you change your mind? I hope not. If you want to go out with that beautiful colour, go ahead. Be confident. If you think the red lips look good with the yellow dress you're about to wear, then go ahead. As long as it does not looks weird, nobody can say no to you, right? All the tips above are just to giving you some guidance on what you want or might not want to do when wearing the red lipstick.